Thank you for your interest, support, and passion for this cause! We are a budding business in a rapidly growing industry with a strong desire to make an impact in the technology space. Our team is made up of career technology professionals who have come together to put our passion, hard work, time, and finances into this fast-growing community. We have completed two major milestones. This is the time where we all sat around a coffee shop, back porch, or a lunch get-together and discussed ideas and decided we knew we could really make a difference - and make a great technology product for this industry. The co-founder stage is where we began to organize our company (a lot of legal and accounting paperwork), planned the product, built a new brand, and prepared for launch. This stage has been funded 100% from our own pockets. Building a solid and scalable technology platform using Microsoft Azure Cloud. Laying the groundwork for Search Engine Optimization (SEO) to drive our application’s search result index higher and social media integration to allow followers to find us on several outlets. Formalizing the business in the legal and accounting sense to help us facilitate excellence in every dollar that has currently been invested into this company. Building a great website with an integrated CHAT BOT service allows users to engage using Facebook Messenger, Kik, Slack, Skype and other social services. We believe this is one of our greatest accomplishments as Chatbots are becoming a widely used tool of communication that allow people to feel closely connected to applications with the ability to search using ‘real’ language. We are asking for your support to move into the next phase of our growth. Administration costs to continue supporting our technology platform that is currently billed on a monthly basis. This includes all of our virtual assets hosted in Microsoft Azure. Data mining and entry into our growing database is a key business driver. We take pride in providing exhaustive information on all of the materials and services for which people can search. This requires hours of searching the internet, calling to verify validity in current dispensary information and any other valid data we feel is pertinent. Social media marketing: Our reach on social media allows us the potential to reach over 1 billion users. This requires current content to be delivered on a daily basis. Our current focus is on Facebook, Twitter and Instagram, yet we are currently limited in our reach. With your support, we reach the wider community, looking for a better solution to finding information on strains, products, dispensaries and more. Contract software development to rapidly add new features and expand existing ones. (Software development by co-founders would not be paid for out of donations. This applies to outsourced programming/design as needed in a limited capacity). Limited travel and marketing costs to directly and personally engage business partners. By supporting us, your money WILL go towards these necessary obligations and help us continue to focus on the expansion of this suite of applications. Your money WILL NOT go into pockets of any individual as personal compensation, or any expense not directly needed to support this product. When you become a supporter, you will be given access to our private donor section of the website. Open the company for legal and formal equity investment to interested parties. We ask you to support this project with funding. Click the GoGetFunding logo to get started. We have joined with a trusted partner, GoGetFunding, to help crowdfund. 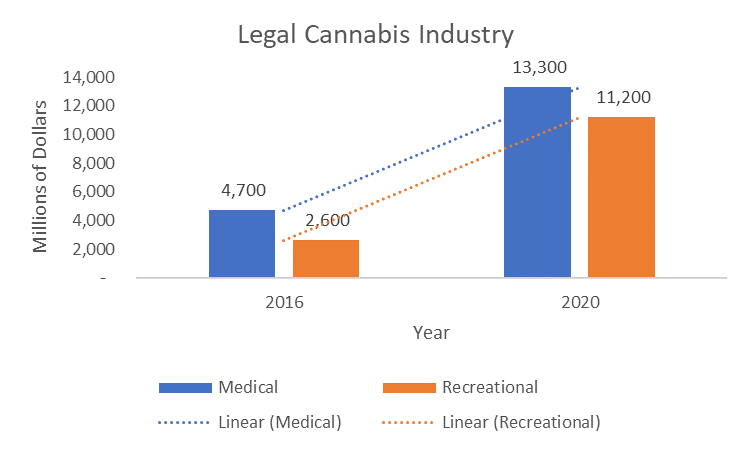 The legal cannabis market was worth an estimated $7.2 billion in 2016 and is projected to grow at a compound annual rate of 17%. Medical marijuana sales are projected to grow from $4.7 billion in 2016 to $13.3 billion in 2020. Adult recreational sales are estimated to jump from $2.6 billion in 2016 to $11.2 billion by 2020.